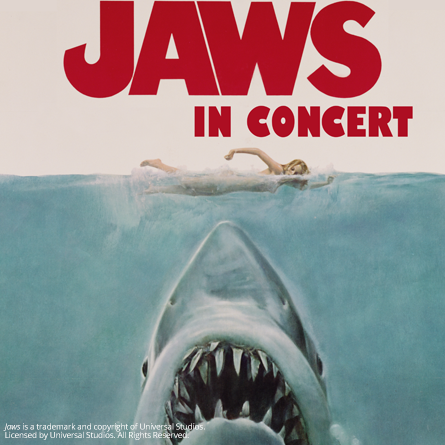 The original summer movie blockbuster, with an Academy Award®-winning score that made John Williams a household name, Jaws is the ultimate film-with-live-orchestra experience! Based on the best-selling novel by Peter Benchley and directed by Steven Spielberg, this masterpiece of suspense tells the tale of a small, New England seaside community terrorized by a predatory great white shark during the busiest weekend of the tourist season – the 4th of July. After several local residents are killed in the waters just off shore, it falls to three unlikely heroes – police chief Martin Brody (Roy Scheider), marine scientist Matt Hooper (Richard Dreyfuss) and surly local sea captain Quint (Robert Shaw) – to hunt down and kill the beast before more lives are lost. Despite a notoriously difficult ocean shoot with constant technical challenges, Jaws became the most successful movie of all time (until the release of Star Wars two years later), and Spielberg has often credited Williams’ iconic score with much of the film’s success. Now for the first time, audiences will have the chance to experience the power of a live symphony orchestra performing the entire score in sync with one of the greatest motion pictures of all time.